Aric Almirola started sixth and finished Stage 1 in sixth to earn five bonus points. Almirola slipped back a couple of spots on the restart but eventually worked his way into the top-five around the halfway point of the stage. The Tampa native reported his Smithfield Get Grilling Ford was “really, really tight in the middle” as the stage began to wind down. In the closing laps of the stage, the 34-year-old was in the sixth position. He pitted for fuel, four tires and adjustments during the break, and a speedy stop by his crew gained Almirola two positions. Almirolastarted Stage 2 in fourth and concluded it in third to amass eight bonus points. Just after the green flag dropped on Stage 2, Almirola moved up to the third position, where he remained until the completion of the stage. During the stage break, Almirola relayed to the Smithfield Ford crew that his No. 10 machine drove better during the stage. He came in for fuel and four tires and exited pit road in fourth. Almirolastarted the final stage in the fourth position and ended it fifth. 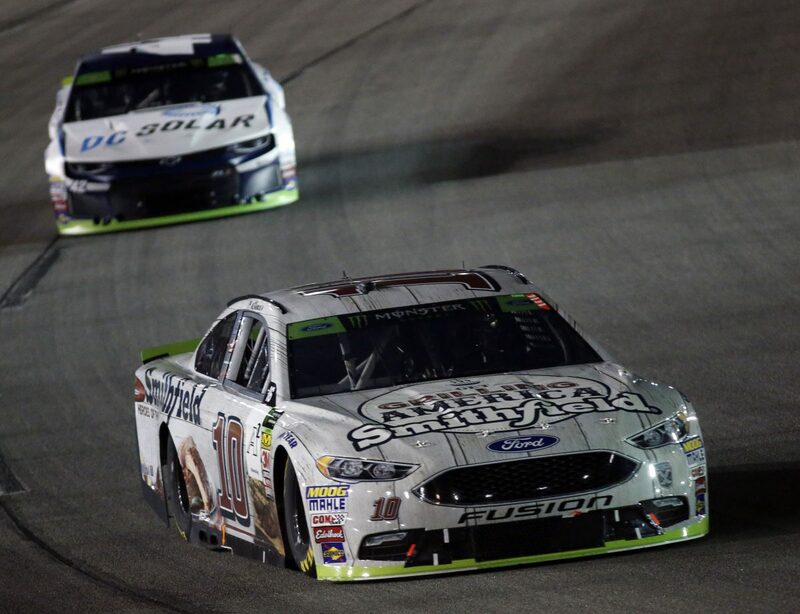 Almirola took over the third position shortly after the restart and then swapped positions for fourth with SHR teammate Kevin Harvick around lap 200. The Ford Fusion driver remained in the fourth position until lap 253. On lap 269, Almirola made a scheduled green-flag pit stop from the fifth position for fuel, four tires and adjustments. Ten laps later he took over the fourth position. At lap 293 Almirola slipped back to fifth after being passed by the No. 9, and he rode there until the first caution of the race was displayed on lap 327. Almirola pitted for fuel and four tires. He restarted fifth on lap 333 and on the next lap moved into fourth. He remained in the top-five for the rest of the evening, finishing fifth. This was Almirola’s second top-five finish of 2018. Almirola earned his second top-five in 14 career Monster Energy NASCAR Cup Series starts at Richmond. Almirola finished sixth in Stage 1 to earn five bonus points, and third in Stage 2 to earn an additional eight bonus points. Almirola led once for one lap – his first at Richmond.